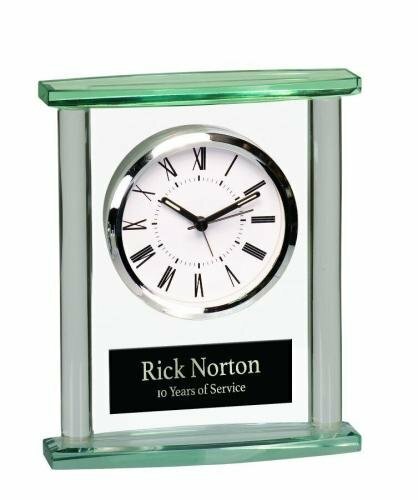 The modern design of this rectangle glass desk clock is enhanced by the combination of clear and jade glass. The 3" clock face in the clear glass is framed by a silver bezel and features black Roman numerals and hands. The rounded clear glass columns at either side of the clock add dimension to the piece and the jade glass top and base give it added visual interest. With plenty of room to personalize beneath the clock face, this elegant clock makes a wonderful recognition for any event, or a personalized gift that is sure to be treasured. 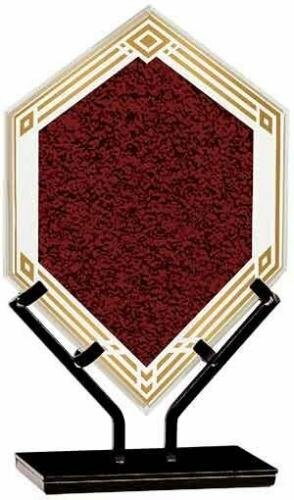 5-3/4" x 7" x 1-3/4"
Genuine Red Alder Plaque. 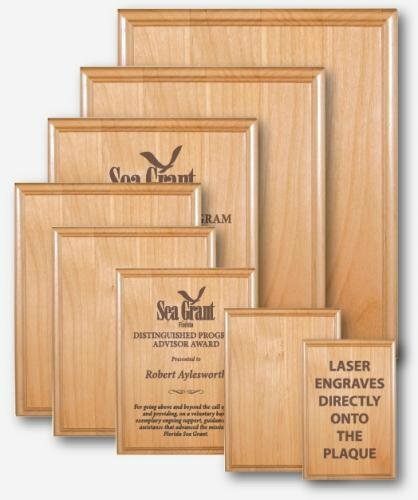 Available in multiple sizes with engraving directly into the plaque wood. 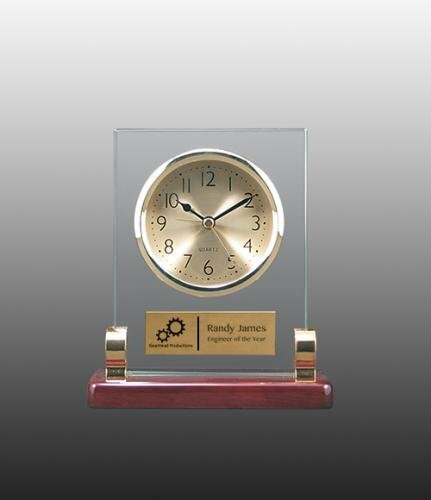 A Perfect employee recognition award, achievement award or sales award. 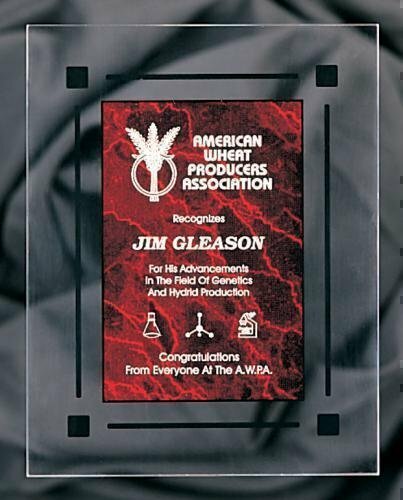 A deep 7/8" back slanting bevel at the top of this elegant acrylic and the ¾” channels cut into each side catch the reflected color from the bottom to create a soft red frame that highlights the large personalization area. 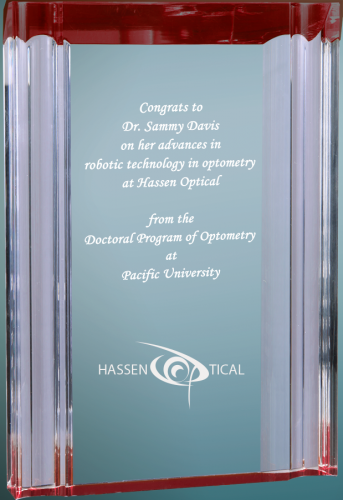 Available in 2 sizes and 4 colors, this stunning acrylic gives you multiple award options, and at almost an inch thick, this sturdy free standing award is a beautiful tribute to excellence and achievement that anyone would be proud to receive. 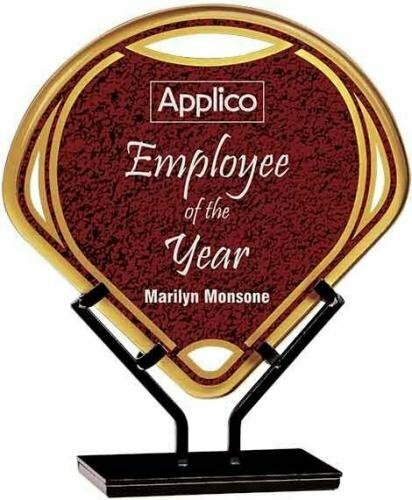 The Red Marble Acrylic Award Recognition Plaque is perfect for any awards and recognition presentation including employee award recognition, achievement award recognition and sales award recognition.